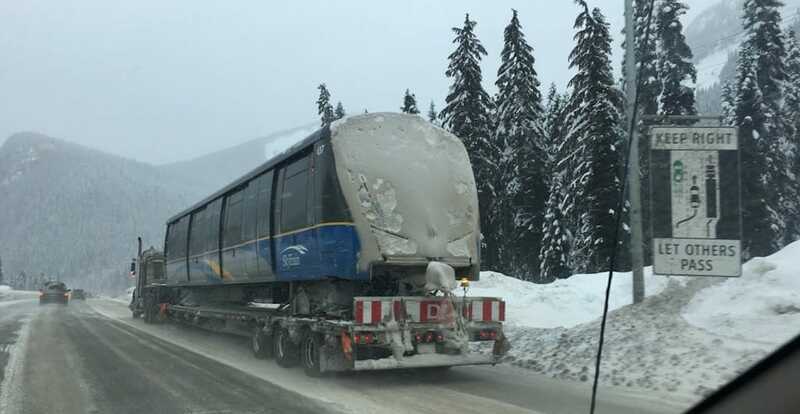 It’s not every day that you spot a SkyTrain car traversing the steep and snowy mountain highway routes of the BC Interior. A photo taken by Ashley Nobeashi shows a new Mark III train car on a flatbed truck and partially covered in snow. She told Daily Hive the photo was captured on Sunday near the Coquihalla Summit. It is just one of 56 new Mark III cars that will be delivered to TransLink’s SkyTrain operations and maintenance centre in Burnaby by the end of the year. Once arrived at the Edmonds facility, they will be further assembled into four-car articulated trains and undergo rigorous final testing and commissioning. All of these cars were manufactured at Bombardier’s plant in Kingston, Ontario, and each car is shipped across the country on a flatbed truck. A number of cars have arrived, and some trains are already in regular service. The $210-million order of new cars will increase capacity on the train systems significantly, with a 10% increase on the Expo Line and 23% increase for the Millennium Line. Another $88-million order from South Korea’s Hyundai Rotem will deliver 24 additional cars for the Canada Line by 2020. TransLink is also exploring further car orders, as many as 203 cars, for the Expo Line and Millennium Line. A bidding process will be launched later this year, and the first cars from this next batch could begin to arrive as early as 2023.